Why the UN's new chief represents a pivotal moment for "Brand Portugal"
The selection of António Guterres -- Portugal's popular and widely respected former Prime Minister -- as the new secretary general of the United Nations is a bold choice for world's largest international organization, an historic milestone for the people of Portugal, and an unprecedented opportunity to enhance Portugal as a brand at a critical time for the nation. Just as companies must carefully nurture their brand image to achieve success, a country's reputation - how it positions itself and is perceived by others - is vital in helping it to attract foreign investment, boost tourism, drive economic growth, and strengthen its soft power. For a country of just 35,000 square-miles, Portugal has long played an outsized and influential role in global business, trade, and politics. From the fifteenth to the seventeenth century, Portugal pioneered maritime exploration, extending its culture and language around the globe from Brazil to Mozambique to Macau, and it was responsible for important advances in nautical sciences, cartography, astronomy, and ship building. Five centuries later, Portugal finds itself at a critical juncture. Following a 78-billion-euro bailout from the European Union and the International Monetary Fund in 2011, the country is still working to stabilize its economy and maintain its credit rating. Under the leadership of its new President, Marcelo Rebelo de Sousa, the government is taking the right steps to narrow its budget deficit by controlling state spending and implementing tax increases and reforms, while also making progress on job creation (its unemployment rate is currently at a six-year low). The good news, however, is that Portugal does not need to entirely reinvent itself or its economy to ensure that it remains globally competitive. It already possesses distinct advantages, and its ability to spotlight and leverage them in the coming months and years will prove vital in helping to both lure foreign investors and talent and boost trade and tourism. First, Portugal should celebrate António Guterres, who has won praise and respect from leaders across the globe. 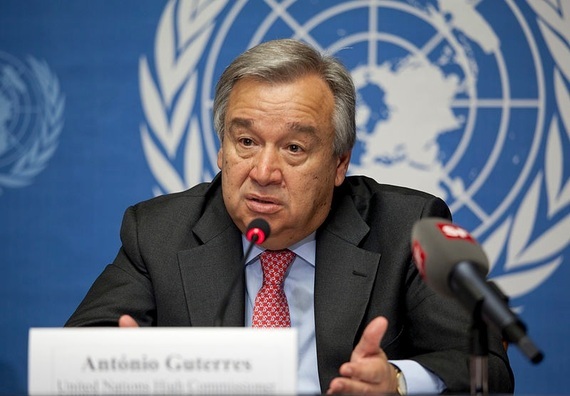 As the UN high commissioner for refugees since 2005, Guterres has earned a reputation as a moral, eloquent, outspoken, and persuasive voice for human rights and social justice. At the same time, he has proven to be an effective manager, streamlining his commission's budget and staff while growing its capacity to handle the world's estimated 65 million refugees. Guterres' ascension to the world stage provides an opportunity for Portugal to embrace and promote the shared values and leadership qualities he exemplifies. Second, Portugal must highlight its leadership in business, innovation, and trade. It is important to remember that Portuguese is the sixth most widely spoken language in the world after Chinese, Spanish, English, Hindi, and Arabic. That's why many international companies have chosen Portuguese executives as their CEOs, including António Horta Osório of Lloyds Bank and Carlos Gomes of Peugeot Citroen. The country's modern infrastructure, advanced communication systems, and business-friendly environment have also made Portugal home to a growing number of leading tech and clean energy startups as well as an attractive location for such foreign investors as Danone, Cisco, and Nokia, which have recently opened or announced plans to build major new facilities in the country. On the trade front, President de Sousa has made it a priority to rebuild business relationships between Portugal, Europe and Africa. Third, Portugal must strengthen its soft power by harnessing its influence in sports, culture, cuisine, and more. Portugal is home to Cristiano Ronaldo, one of the world's top football players, as well as José Mourinho, one of the world's best coaches; in 2015, for the first time ever, its team won the European championship. Along with sports stars, Portugal boasts a wide range of world-renowned ambassadors, including neuroscientist António Damásio, actress Daniela Ruah, chef Jose Avillez, singer Mariza, and artist Joana Vasconcelos. Fourth, Portugal can enhance its image by reinforcing its position as an increasingly popular tourist destination. In 2015, Portugal broke records for the most foreign visitors in its history, fueling a booming industry now worth more than $11.6 billion. Encouraging everyone - from tourists to investors - to experience Portugal firsthand is ultimately one of the most effective way to build its reputation and image. By effectively capitalizing on these areas of leadership and expertise at this critical turning point, Portugal can take charge of its future and write an exciting and dynamic new chapter in its history.